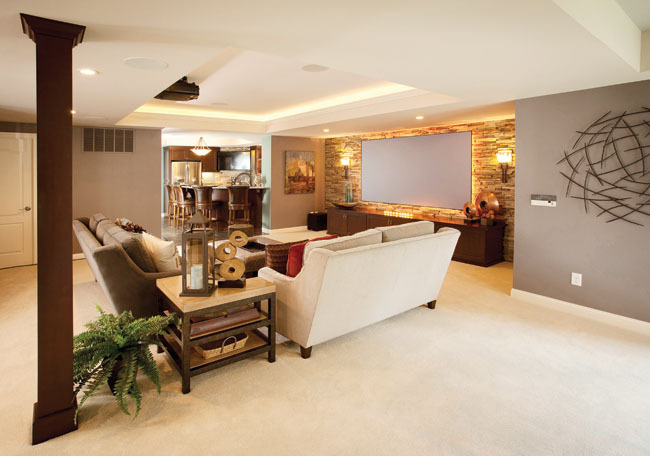 The home theater system from Sound Advice is what the homeowner loves most about his renovated lower level. Chris and Jen built their 5-year-old, Anderson Township home, knowing that they wanted to finish the lower level at some point, but the recession stopped them from going with that plan at first. 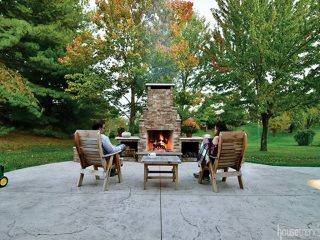 “We didn’t want to put the extra money into the house at that time we were building,” shares Chris, but that did not stop the couple from planning the project. 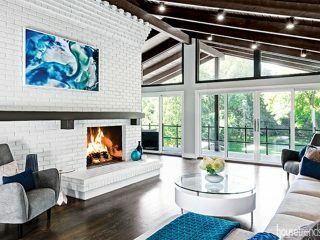 What emerged is this elegant, 1,500-square-foot showcase, which includes a media room, game area, bar, home gym, full bath, wine room and woodshop. Chris and Jen reached out to Pat Zicka of Zicka Homes since his family built the couple’s home. “Pat was slammed working on another project and didn’t have the time. He hooked us up with Israel Howard and Mike Ralston of Howard Construction,” says Chris. 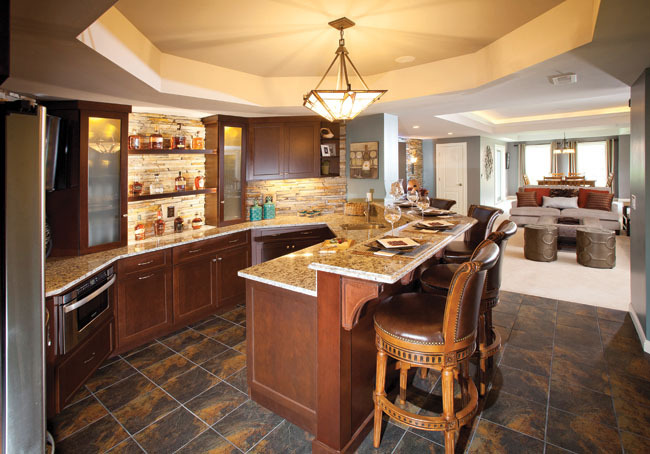 While working with Howard Construction, the couple was referred to Jocelyn Privett of C&W Custom Woodworking to help design the cabinetry required in the basement. 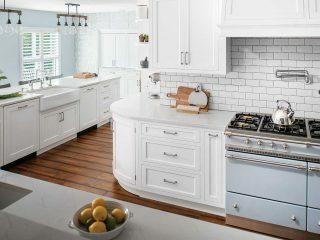 Ironically, Jocelyn was the person who they spoke to, but never met, about the cabinetry used throughout their house during the original construction. “Jocelyn sat down with us and worked out every detail,” says Chris. 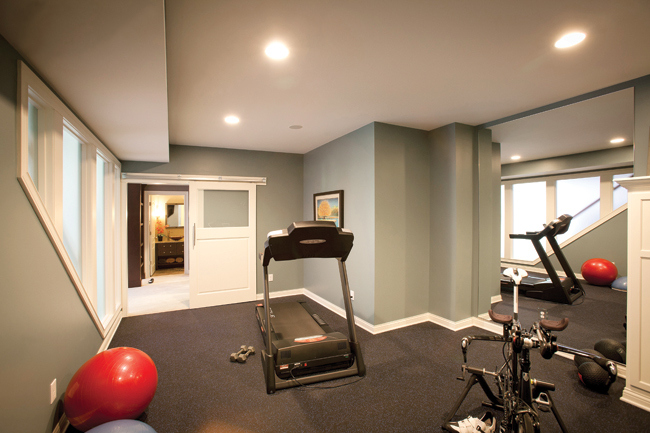 The couple wanted natural light in the workout room, a design element Chris’ brother suggested and drew into the original plans, but Jen struggled with the idea of having clear glass panels open to the rest of the room. “It would feel like I was in a fishbowl,” she explains. Jocelyn suggested frosted glass panels that would still allow light to filter in, but would also give Jen the privacy she craved. The flooring in the workout room is black and blue speckled rubberized tiles that fit together seamlessly. It is the same type of material found in professional gyms and is easy to clean with just a mop. 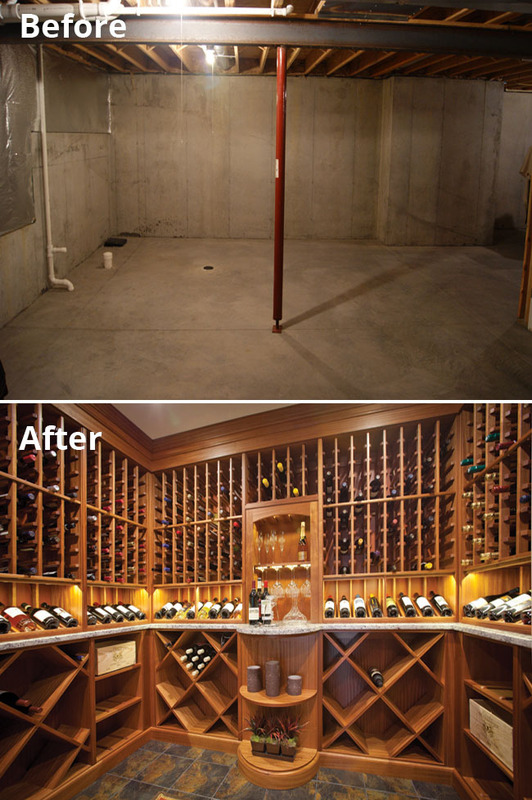 There is a floor-length mirror in the room as well as a cabinet designed by Jocelyn to hide the main water line that enters the house and is also used for small exercise equipment storage. 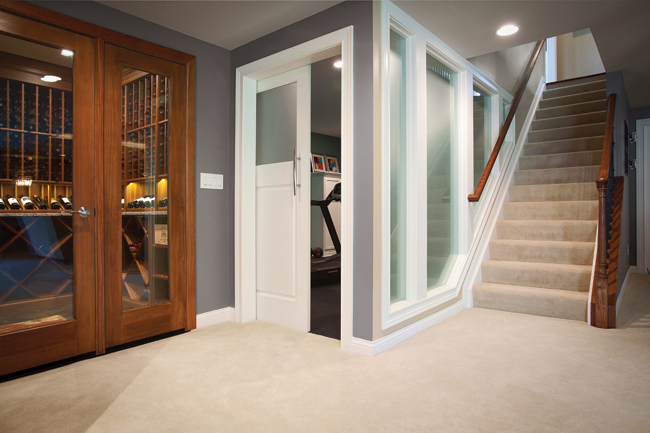 Using Chris’ brother’s concept for a large sliding barn door in the workout room that could handle massive exercise equipment being moved, such as a treadmill or elliptical, Jocelyn designed a door that incorporated frosted glass and allowed additional natural light. Every column is hidden behind walls except for two: one in the media room and one by the bathroom. Because the one by the bathroom seemed so intrusive, Jocelyn came up with the clever idea to create a shelving unit with the solo column and part of the wall. 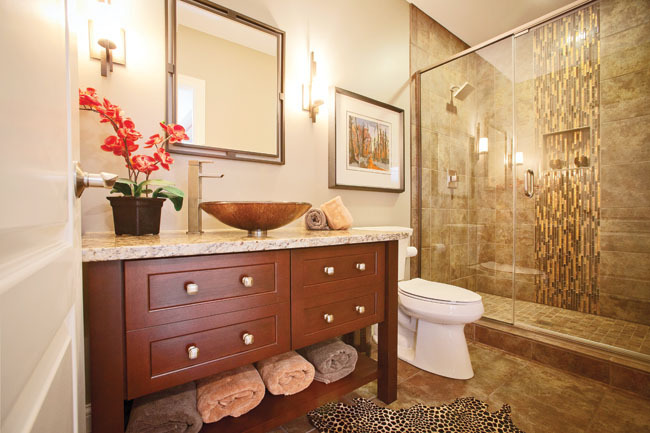 It provides a great screen between the bathroom and rest of the space, but also allows for various knickknacks to have a home. 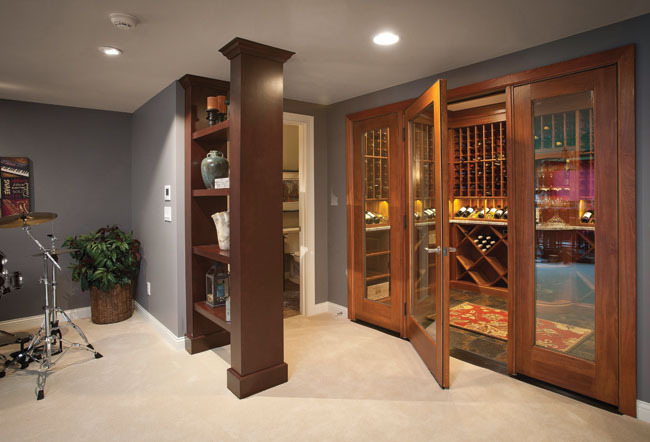 Just off to the side of the wine room is a spacious bathroom. 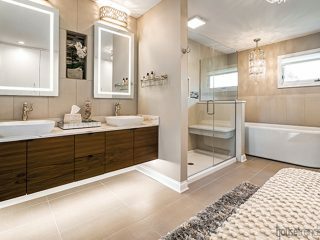 The glass shower door shows off the glass mosaic tile seen in the shower, and the homeowner picked out the vessel sink, which helps to give off a spa-like feel that anyone can enjoy.